The factors affecting these processes such as stream velocity, slope and geology. This is the action of plants on rock. Tree roots can grow and crack or even split rocks. Other plants such as lichens release acids that can eat away at rock over time. Slightly acidic rainfall chemically erodes rock - this is especially important in alkaline rock such as limestone. 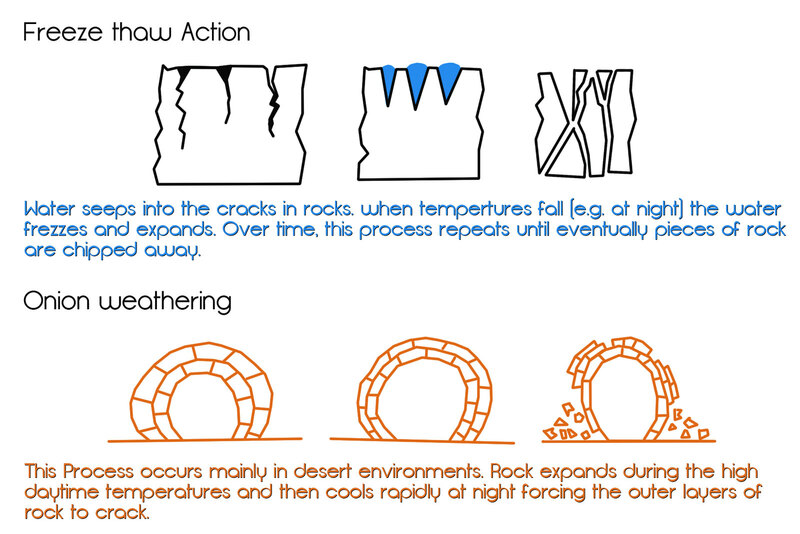 Once rocks have been broken down by the processes of weathering, the broken rock starts to move down the slope under the force of gravity, this can take several forms but is known collectively as a mass movement. Mass movements vary with regards to size and speed. On gentle slopes soil creep can occur whereas steeper slopes create much faster movements such as mudslides and landslides. Erosion is the wearing away of the land. 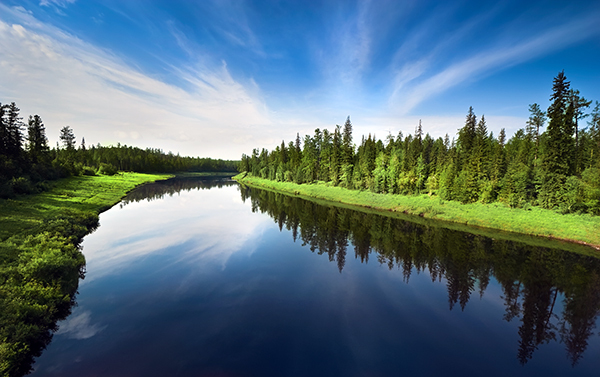 There are several ways that a river can erode the channel and valley. This is the sheer force of the water crashing against the banks and bed, breaking away pieces of rock. Material carried by the river (load) wears away the banks and bed much like the action of sandpaper on wood. The rock in the banks and bed can be chemically eroded by the slightly acidic river water. The river load can be transported in different ways. Deposition is the laying down of material. River load will be deposited when the water no longer has the energy to carry it. 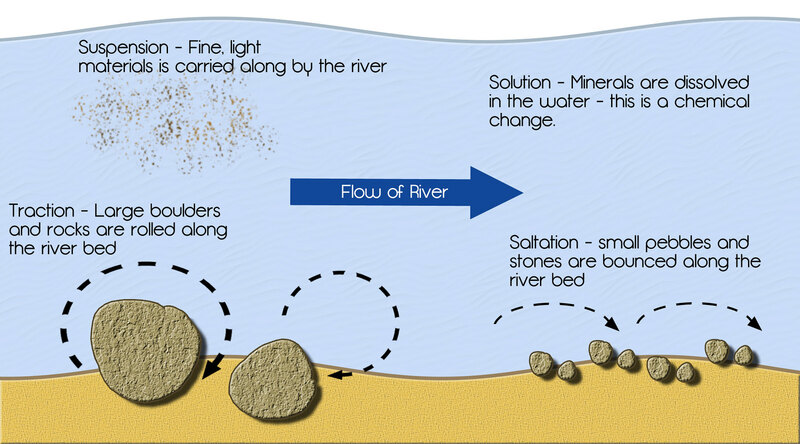 This means that as the river slows down the larger material will be deposited first and the smallest particles (silt) will be deposited last. Write an extended answer describing and explaining the processes of erosion, transportation and deposition. Handy hint: in your exam you will be awarded a mark for every valid point you make e.g. Hydraulic action is the sheer force of the water breaking pieces of rock away. The processes involved in the formation of river features including weathering and mass movement, erosion and deposition? The factors affecting these processes such as stream velocity, slope and geology?